Off a deep wall, we found this Iridescent Glassy Sponge and at the base a spray of vivid Orange Thread Gorgonians. * Off a deep wall, we found this Iridescent Glassy Sponge (Callyspongia plicifera). At the base of the sponge was a spray of vivid Orange Thread Gorgonians (Ellisella sp.). The intense color of the sponge contrasts nicely with the brilliant orange-red of the Gorgonian. 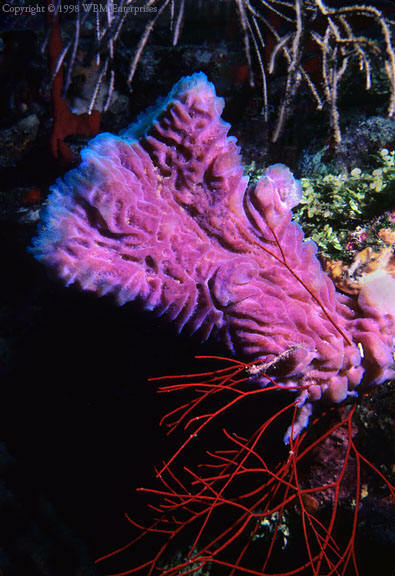 In the upper left corner, barely visible, is the Red Rope Sponge (Haliclona rubra). Overhanging the scene are what appears to be Sea Feathers (Pseudopterogorgia sp. ).